Ribbon Seals (Histriophoca Fasciata) are easily identified by their beautiful fur coloration, which is made up of 2 white circles and two white bands or ribbons while the rest of the animal is dark brown or black. The colour contrast in males tends to be even more striking. These seals spend much of their time being seasonally ice-bound and they migrate southwards during the winter months. This migration causes their range to vary between a summer and winter region. Due to the remoteness of their preferred habitat, very little research has been done on the species. During the winter months, Ribbon seals will haul out onto the ice shelf. As spring approaches they will molt and breed. Breeding and pupping mostly takes place in the months of April and May and pups are not born with the same markings as their adult counterparts. Ribbon seal pups are born with a whitish fur which is replaced when they are about a month old with a bluish “juvenile” coat, identifiable by a silvery chest colouring. Only when the animal is around 4 years, does it begin to show signs of the adult coat. Weaning takes place after a month. During this time, females may occasionally leave the young to feed. Ribbon Seal pup prior to getting his distinctive adult markings. A diet of high fat content milk enables a new born pup to DOUBLE its size in a matter of 4 weeks! The main predators for this species are Polar Bears, Killer Whales and Greenland Sharks. Other factors that put them at risk include global warming, marine pollution, entanglement and disturbances from oil and gas exploration and extraction. From the 1950’s through to the mid 1980’s, commercial sealers from Russia killed between 6 500 and 23 000 Ribbon Seals each year, mainly from the area of the Bering Sea. These animals were targeted not only for their beautiful pelts, but for their meat and oil too. The IUCN have this species listed as “Data Deficient” as there is not enough information available for a reliable classification. Ribbon Seals tend to move over the ice rather differently to other types of seal. Instead of clawing their way forward, they slither from side to side. Their diet is comprised of mostly fish, but they also eat squid and a variety of crustaceans. They have been known to dive as deep as 200 m and can hold their breaths for up to 40 minutes while in search of a meal. They consume on average around 9 kg per day. A wary Ribbon Seal hauls out on the ice. Ribbon Seals have an internal air sack found on the right hand side of their bodies, over the rib cage. They are the only pinnipeds to have such and scientists are unable to determine what it is used for. It is assumed that the animal uses this sack to make calls, but as yet this is unproven, as is the theory that the sack is used for buoyancy. Although this species is no longer targeted as much by commercial sealers, subsistence hunting does still occur. Around 100 Ribbon Seals are taken each year in Alaska. During the winter months, Ribbon seals will haul out onto the ice shelf. As spring approaches they will molt and breed. 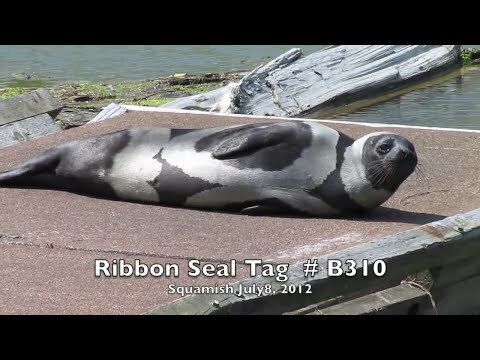 Ribbon Seals are protected by the US Marine Mammal Protection Act of 1972. A study, currently being conducted by the National Marine Mammal Laboratory hopes to increase our knowledge of the species. They are also known as ‘Kukupak’ or ‘Qaqruliq’ by the traditional Alaskans in the Yupik language. A study, currently being conducted by the National Marine Mammal Laboratory hopes to increase our knowledge of the species. Take a look at this rare footage of these beautiful animals!